I will now introduce a concept that was, very much, an epiphany for me vis-à-vis the study and application of command and control. The centrepiece of what I call Gorilla Leadership, the Boyd Decision-Action Cycle is a fundamental concept to a leadership bias, personal and organizational. 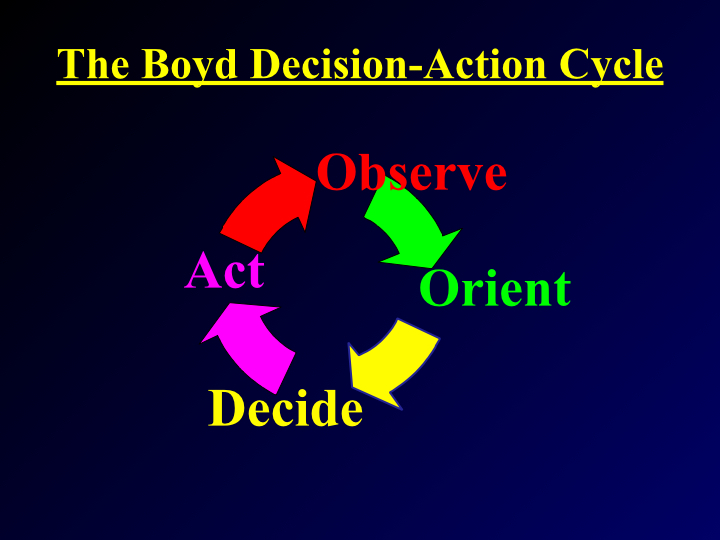 Pictured here is the Boyd Decision-Action Cycle. It was devised by Colonel John Boyd, The Fighter Pilot Who Changed the Art of War (Coram, Robert; Little, Brown and Company, 2002), who was inspirational as he was controversial. He came up with the concept when he was analysing the outcome of dog fights during the Korean War between US and communist aircraft. You will excuse my lack of attention to the details, as I am an infantryman and too much airforce talk bores and evades me. Suffice to say that the communist forces had a much more capable aircraft in terms of speed and firepower but they were being shot down in not-insignificant numbers by the US Airforce. Boyd determined that the reason was the US aircraft had a cockpit that afforded the pilot much better visibility and hence situational and positional awareness than their enemy. Boyd deduced that US pilots could better observe the tactics of their opponent, orient themselves advantageously and launch their ordinance at the decisive moment. His theory was fundamental to the design of modern day fighter aircraft in the United States. Boyd is often referred to as a Warrior Scholar, because his analytical skills were rivalled by his knowledge of arts and sciences. His scientific acumen in the technical world was evident in the influence he had on a generation of aviation, but he was also somewhat of a historian, and an eclectic one at that. 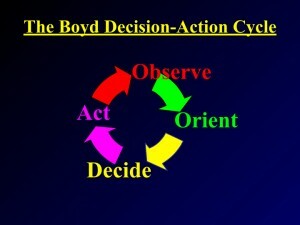 Boyd reverse-engineered many of the key battles of human history and deduced that the forces that could execute the Decision-Action Cycle, often referred to as the OODA Loop, more rapidly than their opponent would usually end up being the victor. So compelling was his analyses and theories that the United States Marine Corps quickly recruited him as a professor in the USMC University at Quantico, Virginia. That was a stroke of luck for Boyd because his big personality and the commensurate size of his oral cavity caused him to become somewhat of an outsider in the fighter jock community. It was a stroke of luck for the Marine Corps also, because embracing the theory of the Boyd Cycle had a profound impact on the operational effectiveness of perhaps the most formidable mass fighting force the world has ever seen: The few, the proud, the Marines! With this as an introduction, my next few posts will elaborate on the OODA Loop, the Holy Grail of leader-biased command.